Welcome back to "Capital Letters," an aptly titled and sporadic feature in which I answer any and all questions regarding the local professional hockey team. Please send all questions to @AdamVingan and follow me anyway because my mother will think that I'm more popular. @AdamVingan What's the back-up goalie situation? Is Peters likely to be sent down? Would that mean Grubauer coming up? After a season in which the Capitals' crease was characterized by upheaval, Braden Holtby has made a career-high 16 straight starts and tied a franchise record Thursday against the Toronto Maple Leafs with his 22nd consecutive appearance. In those 22 games, which tied Wayne Stephenson's record set in 1979-80, Holtby is 14-4-4 with a 2.22 goals-against average, .926 save percentage and two shutouts. Five of Peters' six starts have been made on the second night of back-to-back games. 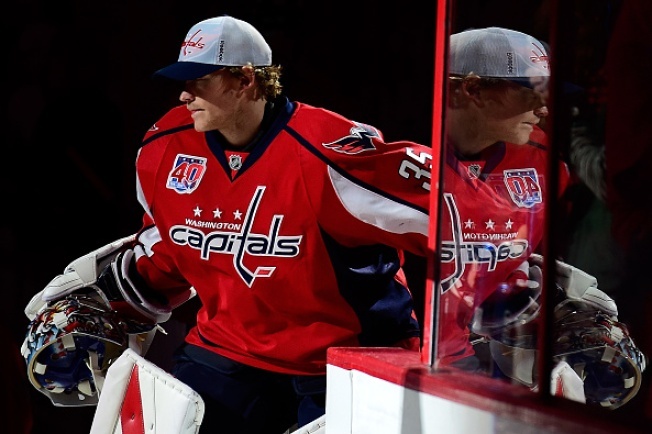 Thursday happens to be the second night of back-to-back games with the Capitals facing the Philadelphia Flyers. And with Flyers goaltender Ray Emery possibly starting, maybe Holtby should sit this one out (though Francois St. Laurent is not working the game, so Holtby may not have to worry about being freely assaulted again). The Capitals have openly discussed the possibility of loaning Peters to the Hershey Bears of the American Hockey League simply so he can play. The issue, however, is that Philipp Grubauer, who started 14 games for Washington last season, is currently sidelined by a lower-body injury. If Peters were to start in Hershey, that would leave Pheonix Copley as the likely recall. I think Washington would be more confident in having Peters nearby than an unproven NHL commodity in case something were to happen to Holtby. "We're still waiting to hear what their plans are," Hershey coach Troy Mann told Tim Leone. "I think we know it's a possibility that he could come down to play a couple games. But until we get official word, it's just status quo for us." @AdamVingan will backstrom be the only career point per game player to never make an all star team? Nine players have more points than Backstrom since he entered the League. Four have more assists. None had more primary power-play assists in his first seven seasons, and only Ovechkin has more power-play points. I do not think that Backstrom will be the only career point-per-game player to never make an All-Star team because I think he will finally make one this season. He leads the Capitals with 39 points, his 27 assists are seventh in the league and he is one of 16 players currently averaging at least one point per game. Latvia single-handedly voted Buffalo Sabres forward Zemgus Girgensons into the game, while the rest of the world selected a quarter of the Chicago Blackhawks' roster. The other players selected will be announced Saturday. I believe Backstrom will be one of them. He should be, at least. @AdamVingan this is a #flashforward question. If you had to do the April lineup today, who is playing with 19 and 8? @AdamVingan I'm struck by how much Trotz shuffles his top line.What about allowing one guy to play with Ovi and Backi and develop chemistry? Andre Burakovsky has spent the past two games playing right wing to Alex Ovechkin's left wing and Backstrom's center on Washington's first line. The 19-year-old rookie is the seventh first-line wing to play with Ovechkin this season, joining Tom Wilson, Eric Fehr, Joel Ward, Jason Chimera, Jay Beagle and Troy Brouwer. Trotz has chosen which player fills that role situationally. If he wants "work ethic" as he discussed earlier this week, he chooses Beagle. "Heaviness" means Wilson gets a turn. Burakovsky brings a "more skill element." Based on those statistics, Fehr is obviously the most successful in regards to puck possession (though Burakovsky's are promising in the context of a small sample size). Overanalyzing line combinations is what we do. As do the teams themselves, apparently. "When I first got here, guys think that coaches don't hear stuff and they do," Trotz said earlier this week. "I got a lot of, 'I don't know, this guy can't play with this guy, this guy can't play with this guy. We never play well together.' I heard a lot of that. And I was wondering, 'Who could be play with anybody?' Our system and how we play should override everything. I was determined that there's a couple units that I wanted to keep sort of pairs together, but other than that everybody could be interchangable." If you're asking me who I think should be the first-line right wing, I like the idea of Burakovsky, who said that he, Ovechkin and Backstrom could be "dangerous" together. With his transition to center currently on hold, the skill that those three possess could definitely take over a game. I'd run with it for now.